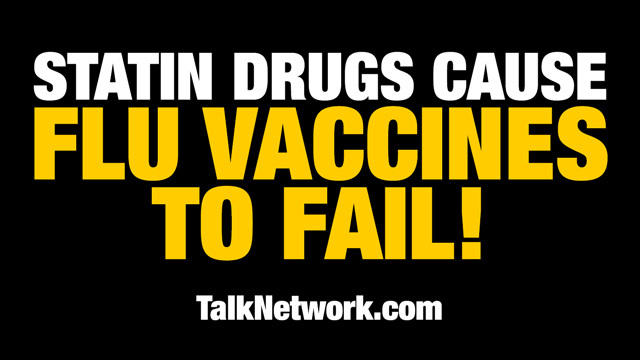 (NaturalNews) If you're taking statin drugs and getting flu shots, the medical joke's on YOU! Researchers have found that statin drugs suppress the immune response that they say is needed to make vaccines work. By taking statin drugs, you're nullifying your body's ability to react to an influenza vaccine, researchers say. (And yes, these researchers totally believe the myth that vaccines work most of the time...) On top of that, you also have all the health risks of statin drugs themselves, which have recently been found to accelerate aging and promote dementia and muscle fatigue. Not only do statin drugs suppress the effectiveness of vaccines, they also suppress your entire immune system, making you more vulnerable to viral infections such as influenza. Thus, taking statin drugs is much like taking down your immune system defense shields, practically guaranteeing you'll get sick if exposed! To educate people about the risks and failures of statin drugs and flu shots, I've posted a new podcast at the Health Ranger Report, my new podcast website. The Health Ranger Report podcast is also available via this link on iTunes, so you can subscribe to the podcast and hear every episode. In this podcast episode, I explain why statin drugs are a dangerous medical fraud and why flu shots are an even worse fraud backed by zero scientific evidence. Listen here and then find more podcasts at HealthRangerReport.com or catch my daily show at TalkNetwork.com.